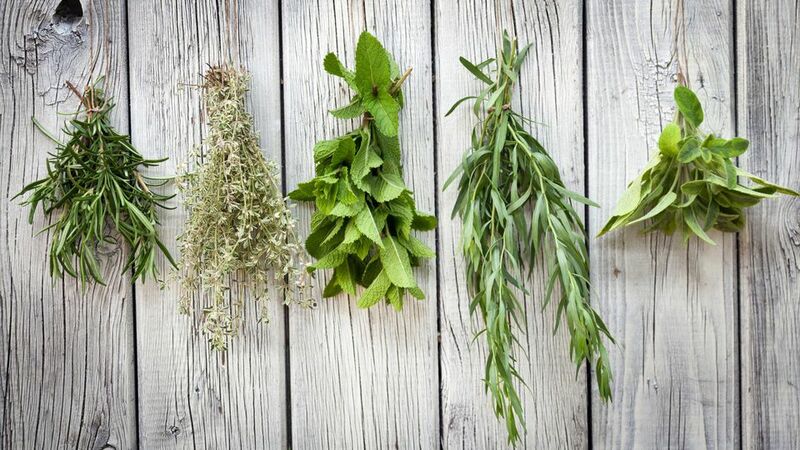 All of the classic herb mixtures share herbs in common, but they differ in their emphasis on one bringing this herb-forward, another adding a background note, and so forth. Although these mixtures can be found, pre-mixed, in the spice section in most supermarkets, it's nice to be able to make your own in case you happen to run out or because you want to tweak the flavor balance. There's currently a fetish among foodies and professional cooks to work with fresh herbs. And when we've had herb gardens we used them a lot - except in the winter when even many of the perennials go dormant. But they often forget why fresh herbs are valued. It's because they're fresh. You get wonderful flavors from the volatile oils and esters they contain that are lost in drying. But cook a fresh herb for more than about five minutes and you lose those same flavors. We insist on fresh herbs when they go into a cooked dish or at the last minute in a sauce. However, if you're going to cook something more than five to ten minutes dried herbs generally work just as well. The recipes below use dried herbs, but you can substitute fresh. In that case, the herbs should be finely chopped before measuring and mixing. If you're mixing fresh herbs you will find it easier to triple the recipes - and you'll end up with the same flavoring power as the dried, in other words, one teaspoon of dried equals one tablespoon of fresh. Of all the classic herb mixtures, this is our favorite, reminding us of the sunny hills of Southern France. It's characterized by its slight emphasis on rosemary and the background note of lavender. We use it to season roasts of all sorts, add it to bouillabaisse or cioppino, and include it in things like quiches and savory tarts. Fine herbes has a distinct but mild licorice or anise flavor from the use of tarragon and chervil. It great with eggs so add some to omelets and soufflés. Try it homemade chicken soup or simply sprinkled on a chicken before roasting and we like it on broiled fish such as tilapia and flounder. Because dried parsley and dried chives don't have much flavor, this is much better made with fresh herbs. The most obvious use of Italian herbs is in making tomato sauces. We like to make some up from fresh herbs and add it to pasta dressed simply with olive oil and some shredded parmesan cheese. It's also excellent in soups and is very good on roast chicken. Add some to a simple vinaigrette of olive oil and vinegar to make an Italian dressing for salads. The dominant flavors in this mix are oregano and marjoram.